Solar energy and wind energy suppliers may need to take a more hands-on approach to the development of energy storage technology. There are reasons to suspect that the fossil fuel energy industry has had a hand in thwarting the commercial development of energy storage technology - to its advantage and to the detriment of the renewable energy industry. As the difference between peak and off-peak electricity tariffs grow ever wider, the payback periods on energy storage systems grow shorter. 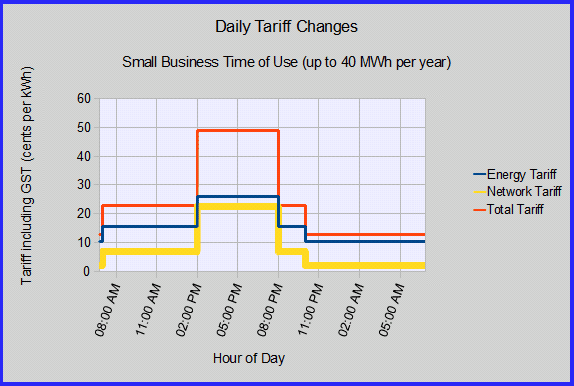 One example is recently announced Time of Use tariffs for small business using up to 40,000 kilowatt-hours (kWh) a year in New South Wales. These have a whopping 36 cents per kWh difference between the peak and off-peak price. The peak period is 2:00 pm to 8:00 pm Monday-Friday. The shoulder periods are 7:00 am to 2:00 pm and 8:00 pm to 10 pm Monday-Friday. 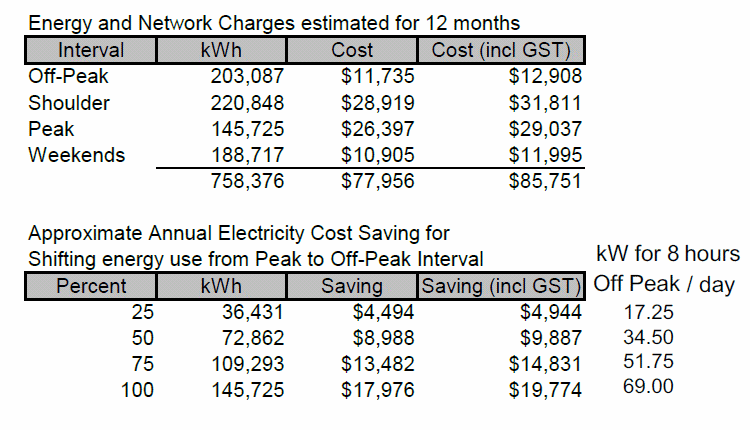 Sources: ORIGIN business price guide for New South Wales customer with Time-of-Use meter and annual electricity consumption falling within the Small Business Energy category for Ausgrid (Code EA225 = Less than 40 Megawatt-hours per year). 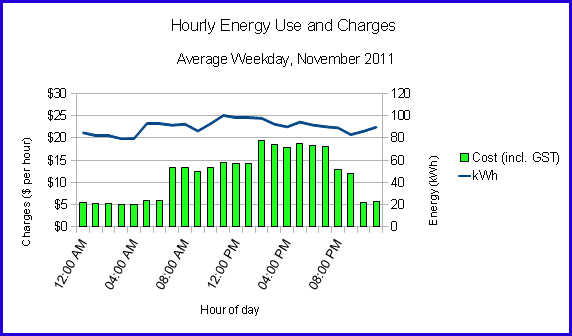 During the peak period of 2:00 pm to 8:00 pm each day 60 kilowatt-hours is used. This costs $29.24 per day and $7,601.88 a year. The cost of this much energy at the off-peak tariff is only $0.64 per day and $1,990.56 a year. That is $5,611.32 a year less than the peak period cost. It is worth keeping a close watch on the availability of 60-70 kWh Zinc-Air batteries that are estimated to cost about $10,000. This amount of energy storage could deliver the saving of about $5,600 a year calculated in the above example. Zinc-Air Fuel Cells were heralded as a great idea over ten years ago. Many investors put money into a series of start-ups that supposedly were intended to bring the technology to market. Some of the investors formed the view that their funds were in fact collected for the benefit of company directors and relatives of company directors. The technology may well be commercially viable and the fate of the start-up companies may have hinged on other factors. For example, company directors named in a web post by disaffected shareholders are also company officers in businesses involved in coal seam gas production. Commercially viable energy storage devices, whether they are Zinc-Air Refuelable Batteries developed at the prestigious Lawrence Livermore National Laboratory, or Vanadium Redox Flow Batteries invented and developed at the University of New South Wales, will greatly assist the commercial success of renewable energy technology. This success may come at the expense of fossil fuel energy suppliers. Company directors with substantial financial interests in the coal seam gas industry may not be highly motivated to bring a competing technology such as zinc-air energy storage successfully to market. Mr Hunt acknowledged poles and wires had been "over built" to deal with the relatively few days of extreme energy use each year - for example scorching hot days when everyone runs air-conditioning. "(But) you don't have to gold-plate, as it's described, if you build in the capacity to reduce demand on those days by striking agreements with large energy consumers (such as) supermarkets, which can power-down their large refrigeration units on hot days and then do the cooling later on at night," he told ABC TV on Wednesday. Their view was that demand reduction could have a "double benefit" with positive outcomes for providers and consumers. 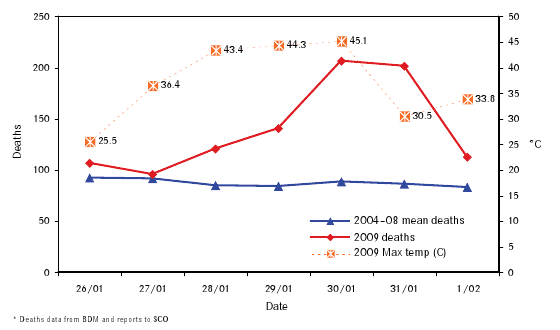 Mr Hunt noted that demand reduction had been introduced very successfully in Western Australia but it hadn't been implemented on the eastern seaboard. TransGrid has announced a major new initiative to help reduce peak electricity demand in metropolitan Sydney this summer – potentially saving the power used by up to 50,000 air conditioners. TransGrid Managing Director, Mr Peter McIntyre, said this major new initiative is one of the largest demand management programs ever undertaken in the Sydney metropolitan area. “TransGrid has reached an agreement with EnerNOC, Inc., a global provider of demand side response services, to support Sydney’s high voltage electricity grid this coming summer,” said Mr McIntyre. Ms Gillard on Sunday announced a strategy to save Australian families up to $250 a year on their electricity bills. The strategy would tackle the real drivers of energy price rises such as overinvestment in poles and wires - or "gold plating" - of the electricity network, she said. But opposition climate change spokesman Greg Hunt said the plan [that is, his plan and TransGrid's major initiative] was a "stunt". The United States coal industry, the Environment Protection Agency (the EPA) and climate change sceptic Fred Singer have finally arrived at a consensus on energy generation technology that dramatically reduces carbon dioxide emissions. The contested issue of what contribution carbon dioxide emissions make to climate change was important when climate change sceptics and deniers were paralyzed with fear that low emission energy generation would result in poverty and starvation. With that alarmist outcome put to rest, the heat has gone from the debate. The crucial change is the long-awaited consensus on action that lowers carbon dioxide emissions. The question of whether this action will influence climate change or not is a different matter. As mentioned above, the heat and urgency has gone from this unresolved issue. "Combined-cycle" gas power plants can reach efficiencies of 60% or more, compared to heat efficiencies of nuclear power plants of 35% or coal plants of 40%. It gets even better than that. Gas-fired electricity generation is essentially non-polluting and user-friendly, and it can be placed in close proximity to wherever power is needed, making distributed generation economically feasible. For example, a large apartment building of 1,000 units could use its own 10-megawatt power plant. But once installed, it becomes possible to consider co-generation, with the waste heat used for space heating, air-conditioning, hot water, laundry, and other process-heat applications -- and even desalination. One can imagine energy efficiencies of as much as 80%, more than double what is achieved today. It would also simplify the problem of waste-heat disposal. So what needs to be done? The first step is to have a White House that strongly believes in the need for low-cost energy to promote economic growth, increase prosperity, and fight poverty. Electricity costs should "skyrocket" downward, not upward. Coal-to-Gas is an Off-the-Shelf Energy Solution, by Frank Clemente. The coal lobby has removed the web pages for "Coal Can Do That". The coal lobby has removed the cached copy of the web pages for "Coal Can Do That". You may still read a copy of the "Coal Can Do That" article "Coal-to-Gas is Off-the-Shelf Energy Solution" from February 2009 by Dr. Frank Clemente. Substitute natural gas (SNG), the product of a coal-to-gas process, is an established technology that has been around for a century and is currently in use throughout the world. Substitute natural gas technology produces pipeline quality natural gas equivalents that can be used to fuel power plants, heat homes and manufacture a wide range of goods. It removes 95% of the mercury and virtually 100% of the sulfur. The captured sulfur can be used to make fertilizer. It provides fuel for the hundreds of natural gas power plants, ...boosts the economy of local communities and provides well paying jobs. A planned Muhlenberg County substitute natural gas state-of-the-art facility in Kentucky, for example, will create 1,200 construction jobs for four years, 500 permanent jobs and pump over $100 million into the economy of host Muhlenberg County and surrounding communities. On Tuesday, March 27 2012, the U.S. Environmental Protection Agency (EPA) announced new performance standards limiting carbon dioxide emissions from power plants. The standard, which applies only to new power plants, limits CO2 emissions to 1,000 lbs (454 kilograms) per megawatt-hour (kg CO2/MWh). The proposed rule is significant because it would be the first explicit limit on CO2 emissions in the United States. It effectively brings to an end new construction of conventional coal-fired power plants, which cannot meet the standard. Typically, new coal plants generate about 1,800 lb (815 kg) CO2/MWh (or between 1,600 to 1,900 lb (725 to 860 kg) CO2/MWh). This means any new coal plants will have to adopt new technologies to reduce emissions, namely carbon capture and storage (CCS). Natural gas plants, on the other hand, emit around 800-850 lb (360-385 kg) CO2/MWh, well within the standard. In fact, the EPA based the emission limit on “the performance of widely used natural gas combined cycle (NGCC) technology” and predicts that NGCC will be the predominant choice in new fossil-fuel powered electricity generation. 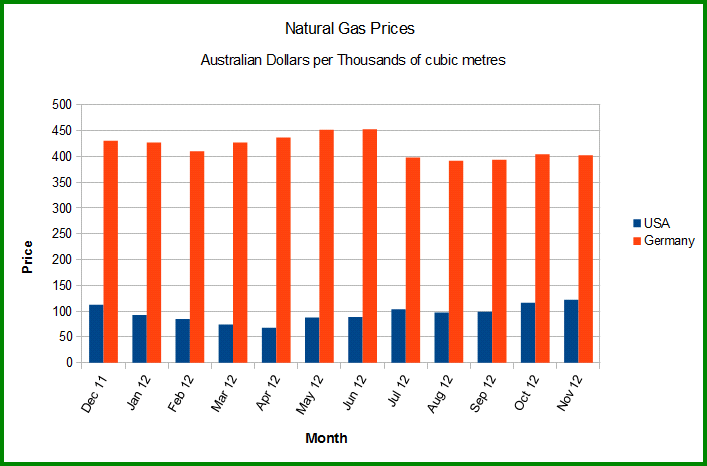 The Australian Energy Market Operator web site lists wholesale prices for natural gas. These are listed in Australian dollars per gigajoule ($/GJ). 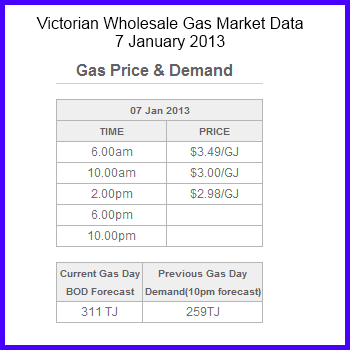 The wholesale price of natural gas in Victoria on 7 January 2013 was about $3 per GJ. This is equivalent to approximately $111 per 1,000 cubic metres - virtually the same as the US natural gas price at the Henry Hub (the blue bars in the above chart). The Australian Institute of Energy web site is offline at present. This inquiry into Australia's oil refining industry is about to commence. At time of writing, 21 submissions had been published. Readers with interests in oil refining will find these submissions of value. An analysis of coal seam gas production and natural resource management in Australia. Williams J., Stubbs T., and Milligan A. October 2012. A report prepared for the Australian Council of Environmental Deans and Directors by John Williams Scientific Services Pty Ltd, Canberra, Australia. There has been no greater influence on Australia's energy markets than coal seam gas since production began over 40 years ago of natural gas and crude oil. This commercial development has ensured that the East Coast again had adequate supplies of natural gas, sufficient enough to lay the foundations for a large LNG industry in Gladstone and that domestic natural gas prices will in future reflect export parity for LNG, the same concept as import parity for crude oil. Secondly, this is another land use which needs to be regulated than like all others. James Fazzino is the managing director and chief executive of Incitec Pivot. The following are extracts from two articles he has written critical of the Australian Government policy on natural gas pricing. Australia has abundant supplies of natural gas but we have the only national government in the world that doesn't give priority to local use, both for downstream processing and for Australian homes. We have allowed major oil and gas companies to control the use of the gas so that export contracts to Japan and China get priority. This means that there is either no gas for Australian manufacturing or, at best, gas is made available at up to four times the current price. We are being asked to pay virtually the same price for Australian gas as energy-starved Japan and China. This is not the global market price because gas is essentially traded in a series of local markets. 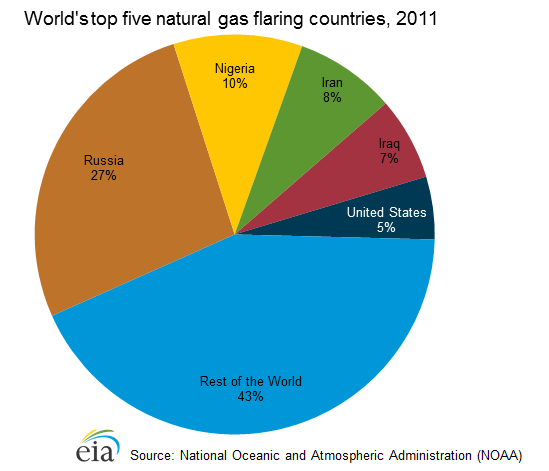 Only 9 per cent of the world's gas is traded globally. The result is that Australian manufacturing plants will close, hundreds of workers will lose their jobs and Australian household energy bills will skyrocket. INCITEC Pivot chief James Fazzino has accused the Gillard government of lacking the vision to take advantage of its gas interests. "For me, it's illogical and short-sighted that Australia is not leveraging our abundant gas resources for the greater national interest," he told an American Chamber of Commerce in Australia lunch in Sydney yesterday. Mr Fazzino said there were fundamental differences between how Australia and the US viewed the access and affordability of energy, in particular gas reserves. "The US sees its gas reserves as an enabler for value-added manufacturing, and this is revitalising their economy," he said. Mr Fazzino said the US proposed developing its energy reserves in support of manufacturing jobs, but Australia had "naively allowed the unfettered export" of gas and was missing a big opportunity to retain gas reserves, or at least a larger portion of them, onshore. 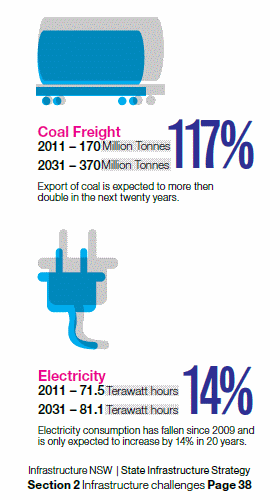 Note coal exports planned to surge. Climate change takes back seat to New South Wales government's budget reliance on coal royalties? 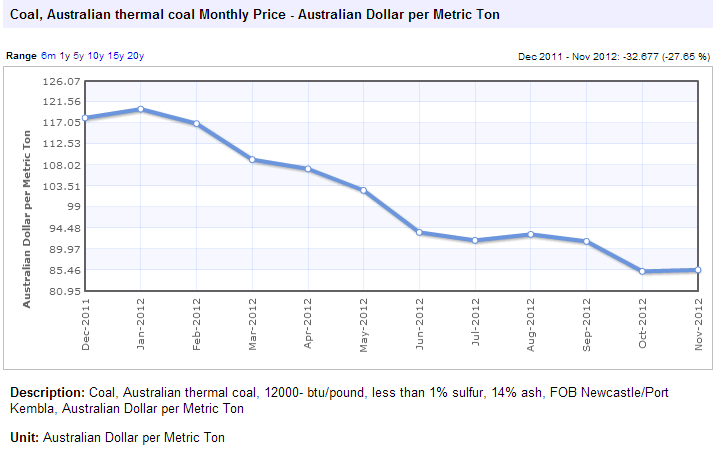 See comment below on falling global price for thermal coal. MADRID—On a weedy dirt lot here, lender Bankia is pursuing its answer to a banking and property crisis that has left Spain with a glut of around one million vacant homes. Its approach: Build even more. Since its property bubble burst in early 2008, the Spanish financial sector has been dogged by fears that it has put off doing a deep clean of the estimated $224 billion (€176 billion) in troubled assets sitting on its books. While energy demand is declining, peak demand has grown at nearly two percent per annum. The ‘gap’ between average energy and peak demand drives the price up further as more infrastructure is needed for less time. Nationally, it is estimated that over $11 billion of infrastructure is used for less than one percent of the time. automation and active configuration and balancing of electricity supply systems are not used to avoid capital expenditure. This has contributed to the high level of electricity distribution investment and consequent high prices. The NSW Government has $30 billion invested in electricity infrastructure (in State Owned Corporations (SOC)). This is $26 billion in network businesses and $4 billion in generation businesses. The electricity sector accounts for 27 percent of past capital and 28 percent of all the Government’s future capital program. The electricity sector has invested an average of $2 billion a year for the past decade. The capital plans of the businesses are to double this to an average of $4 billion a year for the next decade to 2021. 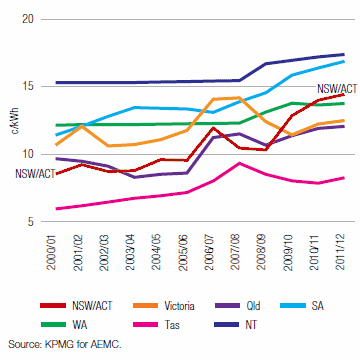 The NSW economy has traditionally benefited from the competitive advantage of low priced energy based upon abundant reserves of coal. This long term competitive advantage has all but disappeared over the last 5 to 10 years. The era of low cost energy is over. High levels of investment in electricity networks and the proliferation of primarily Federal Government renewable energy schemes have caused the average electricity retail bill to double over the past eight years for NSW residential customers, from around $800 to near $1,600 per annum. NSW prices have also grown faster than prices in other States, ... [in fact - faster than EVERY State except South Australia, so the proliferation of primarily Federal Government renewable energy schemes cannot be as significant as this NSW report suggests]. This is shown in Figure 11.2 below.